Edited by Friedemann Sallis, Valentina Bertolani, Jan Burle and Laura Zattra. During the twentieth century, electronic technology enabled the explosive development of new tools for the production, performance, dissemination and conservation of music. The era of the mechanical reproduction of music has, rather ironically, opened up new perspectives, which have contributed to the revitalisation of the performer’s role and the concept of music as performance. 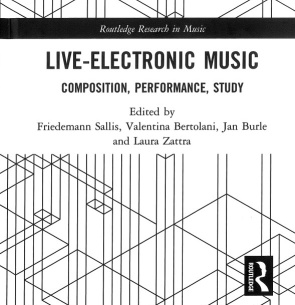 This book examines questions related to music that cannot be set in conventional notation, reporting and reflecting on current research and creative practice primarily in live electronic music. It studies compositions for which the musical text is problematic, i.e. non-existent, incomplete, insufficiently precise or transmitted in a non-traditional format. Thus at the core of this project is an absence. The objects of study lack a reliably precise graphical representation of the work as the composer or the composer/performer conceived or imagined it. How do we compose, perform and study music that cannot be set in conventional notation? The authors of this book examine this problem from the complementary perspectives of the composer the performer, the musical assistant, the audio engineer, the computer scientist and the musicologist. For audio playback please use one of the following browsers: Chrome, Opera, or Vivaldi.